The maximally diverse grouping problem (MDGP) consists of grouping a set of M elements into Gmutually disjoint groups in such a way that the diversity among the elements in each group is maximized. The diversity among the elements in a group is calculated as the sum of the individual distance between each pair of elements, where the notion of distance depends on the specific application context. The objective of the problem is to maximize the overall diversity, i.e., the sum of the diversity of all groups. Feo and Khellaf (1990) proved that the MDGP is NP-hard. We have identified two variants of the MDGP. 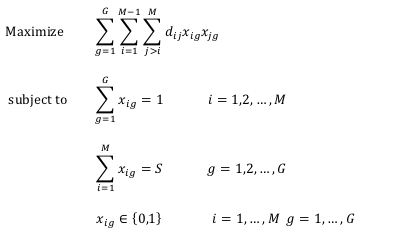 The first one (MDGP1) is the better known and forces all groups to have the same number of elements, with S=M/G. The second variant (MDGP2) allows the size Sg of each group g to be in the interval [ag,bg], where ag <= bg for g = 1,…,G. Clearly, MDGP1 is a special case of the MDGP2 for which ag = bg for all g.
Please make sure that you have Java 6 SE installed in your system. RanReal: This set consists of 160 M x M matrices in which the distance values dij are real numbers generated using a Uniform distribution U(0,100). The number of elements M, the number of groups Gand the limits of each group ag and bg are shown in Table 1. There are 20 instances for each combination of parameters (i.e., each row in Table 1), 10 for instances with equal group size (EGS) and 10 for instances with different group size (DGS). For the 10 instances in EGS, the group size is equal for all instances and is calculated as ag = ag = M / G. For the 10 instances in DGS, the limits of each group (ag and bg) for each instance are generated randomly in the predefined interval. That is, the value of ag is generated in the interval [agmin,agmax] and the value of bg is generated in the interval [bgmin,bgmax]. This data set was introduced by Fan et al. (2011) with M ranging from 10 to 240. The larger instances with M=480 and M=960 had been generated for inclusion in MDGPLIB. RanInt: This set has the same structure and size as RanReal (shown in Table 1) but distances are generated with an integer Uniform distribution. Geo: This set follows the same structure and size as the previous two, however, values are calculated as Euclidean distances between pair of points with coordinates randomly generated in [0,10]. The number of coordinates for each point is generated randomly in the 2 to 21 range. We have performed a computational comparison of the state of the art methods on 240 instances (5 EGS instances and 5 DGS instances for M=10 to 960). All methods were stopped using the same time limit, which varied according to problem size, as specified in Table 2. In this experiment we compute for each instance and each method the relative deviation Dev (in percent) between the best solution value, Value, obtained with the method and the best known value of this instance, BestValue. For each method, we also report the number of instances #Best for which the method obtains the best value. All algorithms were implemented in Java 6 and the experiment was performed in a Intel Core 2 Quad CPU Q 8300 with 6 GiB of RAM and Ubuntu 9.04 64 bits OS. Download the raw data used to calculate this table. Fan, Z. P., Y. Chen, J. Ma and S. Zeng (2011) “A hybrid genetic algorithmic approach to the maximally diverse grouping problem”, Journal of the Operational Research Society, vol. 62, pp. 92‐99. Feo, T. and M. Khellaf (1990) “A class of bounded approximation algorithms for graph partitioning”, Networks, vol. 20, pp. 181‐195. Lotfi V. and R. Cerveny (1991) “A final exam scheduling package”, Journal of the Operational Research Society, vol. 42, pp. 205‐216. Weitz, R. R. and S. Lakshminarayanan (1998) “An empirical comparison of heuristic methods for creating maximally diverse groups”, Journal of the Operational Research Society, vol. 49, no. 6, pp. 635‐646. Gallego, M., Laguna, M., Martí, R. and Duarte, A. (2011) “Tabu Search with Strategic Oscillation for the Maximally Diverse Grouping Problem”, Journal of the Operational Research Society. Accepted. Download.